Training in making music with children aged birth to 7 – particularly in boosting the confidence of non-specialists. 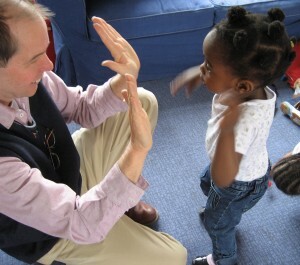 Steve spends half his time as a music teacher and trainer in the Early Years and the rest as a composer and performer. His appearances include television, radio and concert venues throughout the country. 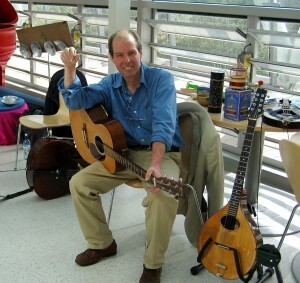 He has written and recorded many songs for the A&C Black music books and given music courses for The Institute of Education, The National Childminders Association, Early Education (BAECE) and many different boroughs. Both non specialist practitioners and competent musicians have attended his courses and observed him working in settings and found the material, which is all provided on CD/booklets, easy to use and inspiring. Many come back for more. Courses are designed to cover all aspects of music making with children and to highlight the connections with all areas of children’s’ development with particular reference to language acquisition, phonics, maths and PSED. Courses can be combined with visits to settings for work with children and parents. Exactly the kind of course that is worthwhile! Practical, entertaining and good supporting materials. I was feeling nervous when I came but now I am looking forward to having a music session with the children. Be a great deal of purposeful fun. You can contact Steve at steve.grocott@btinternet.com and find more information at www.dronesmusic.net – Steve Grocott’s pages.